Active trading has never been more attractive to the average investor with so many online brokers that offer quality trading platforms and low execution costs. Throw in a long-term bull market and it is an ideal environment for new traders to emerge. Once the account is open the biggest decision becomes how do I trade? There are so many styles of trading that work, but the trick is to find an approach that can be applied consistently in a daily or weekly routine. An excellent day trading system is useless to someone who is unable to watch the market while at work. Short-term swing trading may be tough also, as it requires tight stops and selling into strength when a stock has moved in your favor, which requires a trader be present during the session to maximize trade results. For those who work full time, a more realistic approach may be one that takes a step back and relies on the weekly charts for entries and exits, which would allow the trader to monitor the market after the close each day or on the weekend if so desired. Below is a simple yet highly effective trading method that is designed for the busy trader who can’t keep up with the market during the day. The entries and exits are based on a weekly chart. One can scan the market over the weekend and place orders prior to Monday’s open to be executed in real time. The entries and exits are based on the weekly chart using a 10-week and 40-week moving average. Because the entries are based on the weekly chart in relation to the 10-week moving average, this system will weed out stocks that are too volatile or too far extended from the 10-week MA in the short-term. This style of trading works with small and mid-cap growth stocks. Bigger cap stocks are fine as long as they are newer stocks that trade with a decent ATR (average true range). Avoid slower moving stocks that are 20-30 years old. The emphasis should be on newer stocks that are less than 10 years old and are trading at/near all-time highs. The stock must have something going on other than solid technical action, such as impressive earnings and or sales growth, or a recent IPO in a hot industry. Using weekly charts only, scan for stocks that are trading no more than 10-25% off the 52-week high. These patterns should be five weeks in length at a minimum and three to six months at most. Flat bases work best here. 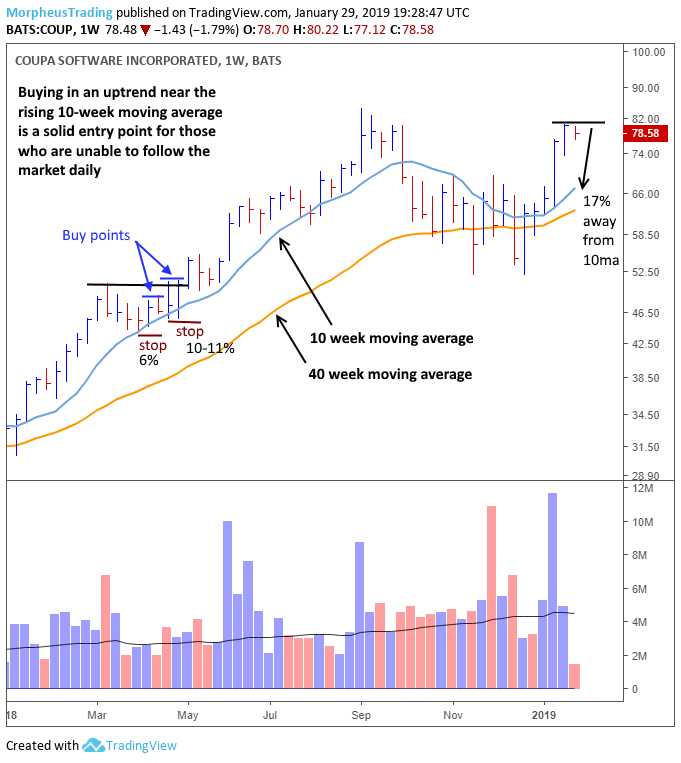 A flat base is typically a five week long base that forms above the 10-week moving average that retraces 15% or less from the recent high (see chart of $COUP below). This base often forms after a breakout from a longer term basing pattern, which makes the pattern more reliable. With all selections (unless an IPO), the 10-week moving average should be above the 40-week moving average. Relative strength is important. Do not confuse relative strength with the RSI indicator, which is an oscillator. Look for a relative strength rating from IBD of 80 or higher. For those who do not subscribe to IBD our MTG screener will do the trick. Finviz.com does not have a relative strength indicator but does have a performance tab that can scan based on how much a stock is up percent wise over a quarter, six months or full year. Look for stocks that are up 30% or more in a quarter, 50% or more in six months and over 75% the past 12 months. This does not apply to IPOs. Focus on stocks that are greater than $15 and trade at least 250,000 shares per day. Once a decent base is found, we then wait for a lower risk entry point to develop. What is a low risk buy point? Generally speaking, once a stock is done making lower lows on a weekly chart we look for a tight-ranged week of trading where the spread from high to low is 10% or less. Up to 12-13% may be fine for cheaper stocks below $20. The 10-week moving average is important as it will act as a buy signal when combined with a prior week’s high. The 10-week moving average is our filter to weed out setups that are too volatile. 1)First, $COUP is trading in a tight range above the 10-week MA, which is in a clear uptrend above the rising 40-week MA. 2) Look for a pause week after the stock stops making lower lows. After a four week pullback to the rising 10-week MA, $COUP finds support at the 10-week MA and stops making lower lows. This is where we begin to look for an entry. Ideally, we look for the price action to pause at least one week before buying. We want the high of the current week to be below the prior week’s high but sometimes it will be just slight above (inside weeks are ideal). Either way, it should look like an obvious pause. 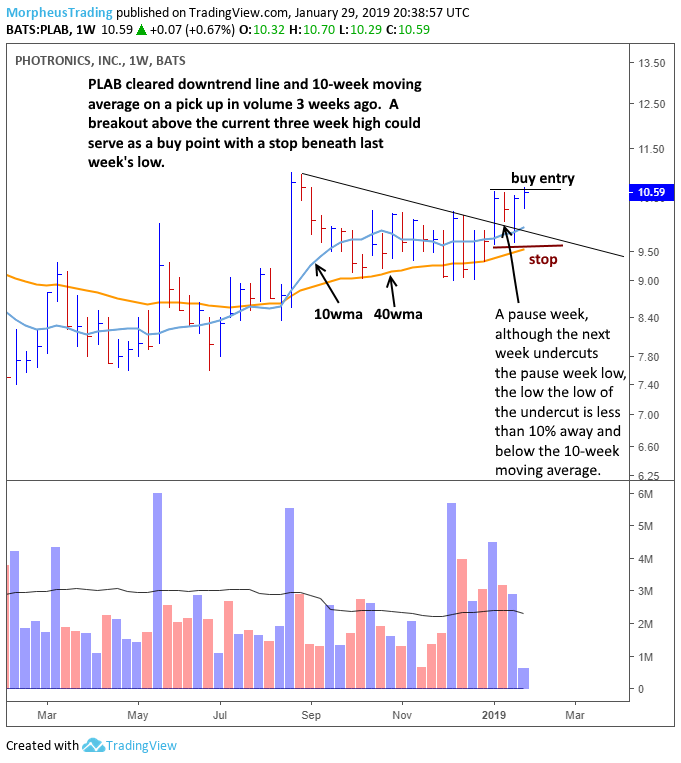 The buy signal itself – After a pause week has printed, look for a move above the two-week high as an entry if there is weekly low that is below the 10-week MA and can serve a stop within 5 to 10% away. One can use the base low as the stop as long as it’s no more than 10-12% away form the entry. This is why flat bases like $COUP are ideal, as they are tight and can offer a few entry points. With $COUP, there is also a breakout entry in play because the stop is only 10-11% away from the low which is also below the 10-week MA. Recap – A buy point is over a tight inside week that is near a 10-week MA. A breakout entry over base highs it can be taken if the stop is less than 10-12% away, and the recent swing low is below the 10-week MA. Remember, the point is to buy above the 10-week MA so that it acts as support. The closer the buy is to the 10-week MA the better. On the chart above, $COUP may form a pause this week, but it’s currently 17% above the 10-week MA making it too risky of an entry. Because this system is tied to the 10-week MA, some stocks may breakout without giving a buy signal. If so, do not chase. Wait for the price to pull back to the 10-week moving average and produce an entry. Rather than load this article up with a bunch of hindsight examples, let’s take a look a few charts that are in play this week. $PLAB has formed a five month long basing pattern that is just under 20% in depth. The 10-week MA is greater than the 40-week MA and both are trending higher. The price action cleared resistance at $10.25 three weeks ago, then formed a pause week. The low of the pause week is above the 10-week MA; however, last week’s shakeout bar undercut the prior week’s low and the 10-week MA. An entry above the three-week high is valid as a stop below the shakeout week low is also below the 10-week MA and is still less than 10% away. $PLAB is an example of an entry that is closer to the base high. For a lower entry, $GH is a pretty good example as it’s a recent IPO that is trading back above its 10-week MA after a four week pullback. 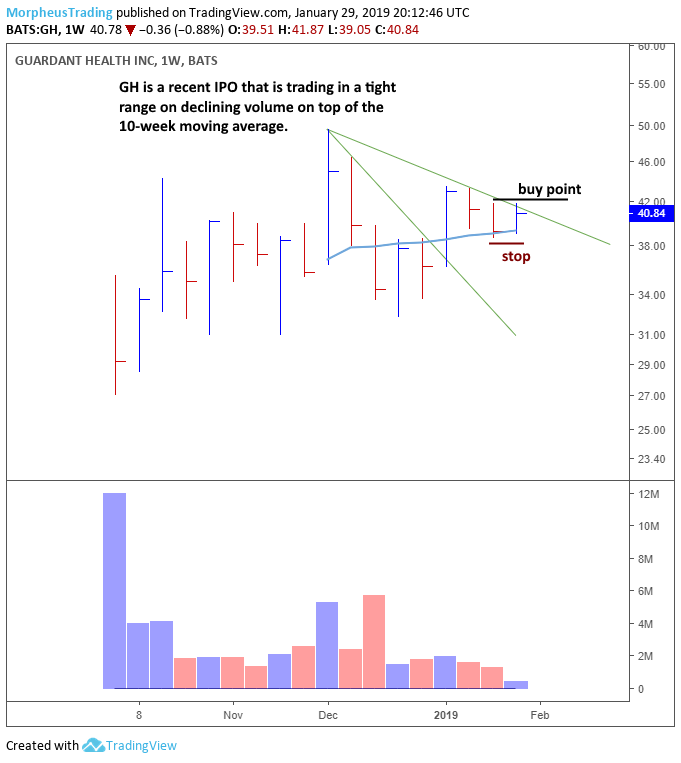 $GH is entering into its third week of sideways action (a pause) while holding the 10-week MA. A move through the two-week high is a potential entry point with a stop below the two week low, plus a little wiggle room at 10% away. By operating with weekly bars only, we can reduce the day to day noise a bit while getting into a consistent weekly routine. While this system does operate on a higher time frame, that does’t mean entries will not stop out. We can’t win em all, so it is important to obey stops. When in a winner, it’s best to sit tight and do nothing at all until the trade is up at least 20% before trimming any size. One could simply switch to the 10-week moving average as a trailing stop once the the 10-week MA is above the highs of the last base. To use the 10-week MA as a stop, wait for a heavy volume close below the 10-week MA as the sell signal. This system works best when the market is also above its 10-week moving average and breakouts in general are working. Do not try to run this system when the S&P 500 and Nasdaq Composite are selling off and below a declining 20-day EMA on a daily chart, especially if the 20-day EMA is below the 50-day SMA. DISCLAIMER: Past results are not necessarily indicative of future results. There is a high degree of risk for substantial losses in trading securities. All data and material on this website and/or electronically delivered to individuals is for informational purposes only, and should not be construed as an offer or solicitation of an offer to buy or sell any securities.